Female president: yes. Hillary Clinton: no. America needs a bit of a change to the presidential seat. We need someone with different views that is truly willing to make progress for the country. Someone that would help make that happen would be a female president. A lot of people think that Hillary Clinton is the answer. I am here to tell you that she is not. Hillary Clinton is not the only woman running for president. There are better female candidates out there. There are currently 4 other possible female candidates that the public should pay more attention to throughout the campaign. Each woman is a successful woman in business, law, and even homeland security. Those potential candidates are Carly Fiorina, Claire McCaskill, Janet Napolitano and Amy Klobuchar. McCaskill, Napolitano and Klobuchar are the potential democratic candidates, while Fiorina is the only potential female Republican candidate. McCaskill is the senior United State senator for Missouri and Klobuchar is the senior United States senator for MInnesota. Napolitano served as Arizona’s governor for six years from 2003-2009 and the secretary of Homeland Security from 2009-2013. Fiorina is the CEO of Hewlett-Packard, the information technology corporation. With their diverse and unique experiences, all of these women have the potential to make true progressions for our country. Hillary Clinton, on the other hand, has been involved in too many scandals in the political field and I think she has the potential to harm the citizens more than help them. Her first big scandal was the Benghazi attack. On Sept. 11, 2012, Islamic militants stormed the American compounds in Benghazi, Libya, and killed multiple American citizens. Multiple rescue calls were made to the White House, but each call was ignored. Who was directly in charge of foreign issues at the time? That would be the Secretary of State, Hillary Clinton, who refuses to give direct answers on what happened that night. To this day, America’s questions are still unanswered about the attack. Clinton has engaged in more recent scandals. It was just released that Hillary Clinton has been using her personal email address to tend to federal issues, rather than use her work email where she can be observed like any other government employee. Using a personal email when you a required to use your work email is extremely dangerous to our country, because of security issues. Top-secret information could have been leaked or stolen from the email address that was not properly protected. While this information was being released to the public, it was also brought to the attention of the public that she had been receiving funds for her family’s foundation that has the goal to make everyone’s ideas become actual actions, the Clinton Foundation, from countries that publicly engage in domestic violence. She should not be accepting funds from countries that openly abuse women, using her personal emails for federal issues and ignoring calls for help from American citizens if she is running to be the first female president. 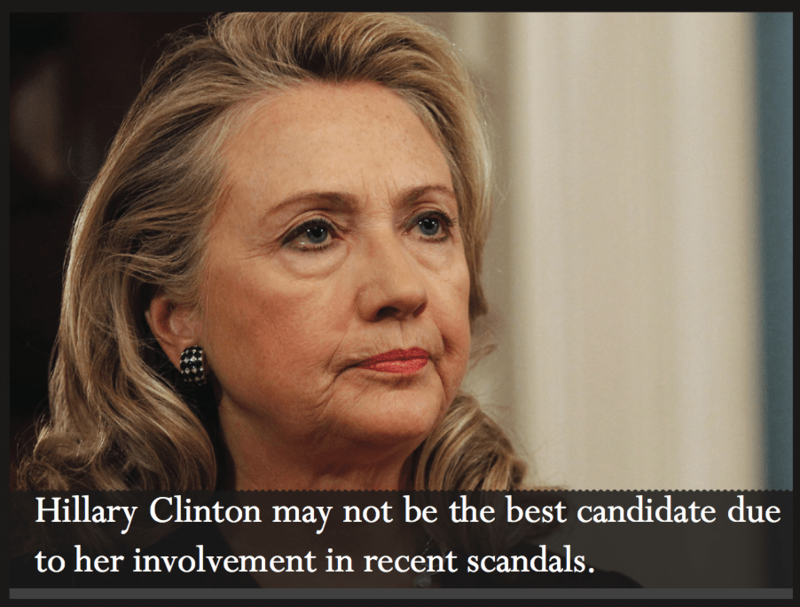 Unless she comes clean about these issues, Hillary Clinton should not be the first female president. I think it is necessary for the progression of the country that the public votes a woman into office. Our country does not represent women well enough and a step towards fixing that flaw would be to elect a female president. May 19, 2015 in May 2015 Magazine, Opinion.